Every child deserves to lead a healthy, productive life. Research shows that health and education are connected—healthy students achieve more in school, and more education leads to a healthier, longer life. School-based physical activity (PA), including physical education (PE) has been linked with multiple learning and health benefits, including improved brain function, academic performance, heart health and body weight. Current US guidelines recommend that children engage in at least one hour of PA each day, but most do not. Schools can play a critically important role in this regard, yet few schools provide students the minimum recommended amount of daily PA. We have limited knowledge about how schools, especially low-resourced schools, focus on and implement strategies to help children be active. 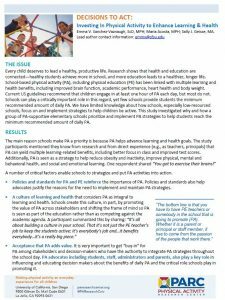 This study investigated why and how a group of PA-supportive elementary schools prioritize and implement PA strategies to help students reach the minimum recommended amount of daily PA.
A number of critical factors enable schools to strategize and put PA activities into action. Policies and standards for PA and PE reinforce the importance of PA.
A culture of learning and health that considers PA as integral to learning and health. Acceptance that PA adds value. Funding and resources often drive decisions to put PA strategies in practice. 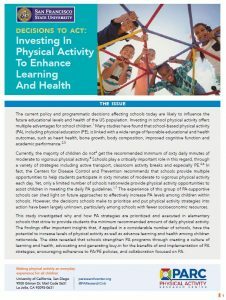 The results offer critical insights for policy and decision-makers to increase PA and PE in schools across the nation. Policymakers can strengthen policies regarding PA/PE by including requirements for funding allocations, guidelines for implementation and compliance measures. Everyone, including policymakers, advocates, schools and school districts, should create and foster a culture of learning and health that embraces the multiple benefits of PA.
Funding agencies can offer grants and technical assistance to support grant writing for low-resourced schools. Schools and school districts can foster collaboration and networking. This includes ensuring that time and resources are available, such as professional development opportunities and conferences related to PA, for staff and community members to share ideas and use resources effectively. A 14-page full report (PDF) and 2-page lay summary (PDF) are available. The following blog post is reprinted from Open Space, the official blog and podcast of NRPA. On today’s episode of Open Space Radio, we’re joined by Aaron Hipp, an Associate Professor of Community Health and Sustainability at NC State University’s Department of Parks, Recreation and Tourism Management. Aaron is currently conducting research on topics such as how, where, and why our public built environments impact health behaviors such as physical activity and recreation, and the effect of the environment where we spend most of our time, such as work, school and sleep, on leisure time physical activity. On the show, we discuss how, statistically, children and people of color have the lowest rates of physical activity as compared to other demographics, and this lack of physical activity has large implications on the health outcomes of communities of color. We examine why these disparities in physical activity exist between demographics, and how parks and improved accessibility to them can be used to close this gap. We also take a look at Aaron’s work on a study through the Physical Activity Research Center (PARC), which is focused on understanding how parks are used by children in communities of color. The study focused on evaluating park use through observation, intercept surveys and community surveys. The Centers for Disease Control and Prevention has provided the below highlights from the data on nutrition, physical activity and chronic conditions. The 2017 YRBSS examines overall trends in 121 health-related behaviors of students in grades 9-12 plus obesity, overweight, and asthma. Most high school students are not meeting the recommended guidelines for daily physical activity. Seventy four percent of high school students are not getting 60 minutes or more of physical activity per day. Fifty percent more students are spending three or more hours per day playing video games or spending leisure time on a computer than getting at least one hour of physical activity. This includes using smartphones and tablets but does not include additional time spent watching tv. The prevalence was higher among black (47.2%) and Hispanic (45.4%) than white (40.7%) students. There is room for improvement in healthy eating for students and large racial disparities exist. There is a slight decrease from 2015 (57.8%) in students that had at least one sports drink the week before the survey, but 52.3% of students had at least one that week. Not enough students are starting their day ready to learn with only 35.3% of students eating breakfast every day. The prevalence of having daily breakfast was higher for white students (38.1%) than black (28.7%) or Hispanic (31.7%) students. Obesity and overweight remains high among high school students and racial disparities persist. More than one-third of students had obesity or were overweight (30.4%). The prevalence of obesity or overweight was higher among Hispanic (37.7%) and black (36%) students than white (26.5%) students. Nationwide, 47.1% of students were trying to lose weight. The prevalence of trying to lose weight was higher among Hispanic (55.4%) than white (45.1%) and black (42.3%) students. A majority of high school students are still not getting enough sleep at night. Seventy-four percent of students are not getting recommended 8 hours of sleep each night. The prevalence of getting 8 or more hours of sleep was higher among 9th-grade (34.8%) than 10th-grade (26.6%), 11th-grade (21.4%), and 12th-grade (17.6%). Many students come to school with a health condition, like asthma, and they need help managing it. Twenty two and a half percent (22.5%) of students have been diagnosed with asthma by a health care provider. Teach and provide students with opportunities to improve their dietary and physical activity behaviors to establish lifelong habits. Provide healthy and enriching alternatives to screen-time (playing video games, watching TV, using smartphones and tablets) through beneficial afterschool options. Support healthy sleep for students by adopting later start times for high school. Support student health, learning and attendance by providing case management and adopting policies to help students manage conditions, like asthma, at school. View all of the YRBSS results here. Parks and playgrounds are a good source of physical activity for kids, but not all kids have access to safe and well-maintained facilities. In fact, lower-income communities and communities of color tend to have less access to quality park and recreation facilities. Research shows that Latinos, African-Americans and lower-income individuals are more likely to live in areas that have fewer park acres per person compared to whites and individuals in higher-income communities. Traffic and crime are also barriers to safe outdoor play and activity in some communities. The concept of “Play Streets” has emerged as a way to promote outdoor play and physical activity for children in neighborhoods without access to safe, well-maintained parks and playgrounds. Play Streets are temporary street closures that, for a specified time, create safe play spaces. 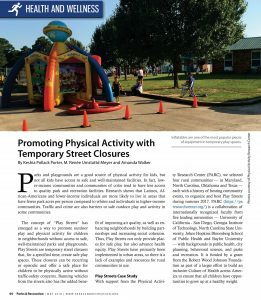 These closures can be recurring or episodic and offer a safe place for children to be physically active without traffic-safety concerns. Banning vehicles from the streets also has the added benefit of improving air quality, as well as enhancing neighborhoods by building partnerships and increasing social cohesion. Thus, Play Streets not only provide places for safe play, but also advance health equity. Play Streets have primarily been implemented in urban areas, so there is a lack of examples and resources for rural communities to use. With support from the Physical Activity Research Center (PARC), we selected four rural communities — in Maryland, North Carolina, Oklahoma and Texas — each with a history of hosting community events, to organize and host Play Streets during summer 2017. PARC is a collaboration of internationally recognized faculty from five leading universities — University of California – San Diego, Georgia Institute of Technology, North Carolina State University, Johns Hopkins Bloomberg School of Public Health and Baylor University — with backgrounds in public health, city planning, behavioral science, and parks and recreation. It is funded by a grant from the Robert Wood Johnson Foundation as part of a larger effort to build an inclusive Culture of Health across America to ensure that all children have opportunities to grow up at a healthy weight. The communities received mini-grants to use to purchase equipment for free play, rent equipment and purchase snacks (we encouraged healthy snacks) for four Play Streets during the summer months. We studied how each community implemented the Play Streets, including how they were advertised, available activities and when they were held. 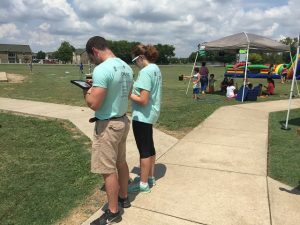 We used a popular and valid tool for observing physical activity, called SOPARC (System for Observing Play and Recreation in Communities), and pedometers to measure how active kids and adults were at the Play Streets. We also completed a systematic review of the peer-reviewed and “grey” literature to document what we know about Play Streets and their impacts on play for children, physical activity levels and communities. Play Streets have mainly been implemented in cities and suburban areas. Play Streets were described as safe places for children to play because of reduced traffic and increased supervision. Only a few studies measured physical activity as an outcome. Play Streets strengthen communities and increase social interactions. Some residents complained about traffic detours and noise on the days that Play Streets were held. Some organizations that hosted Play Streets hope they can decrease crime and violence among adolescents. 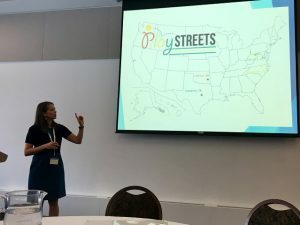 While we are still in the early stages of analyzing the data from the four communities, our preliminary findings are that Play Streets are a good way to get kids active in rural communities. Each of the Play Streets included a variety of activities using temporary play spaces and equipment, with inflatables being the most popular activity and where children seemed to be most active. We also found that in rural communities, streets are not always the most accessible places for Play Streets to be implemented, considering that there are fewer streets and those streets often are major thoroughfares through town (hence, they cannot be closed to traffic!). Play Streets in rural areas might actually be more accessible in other public spaces, like fields and/or parking lots. 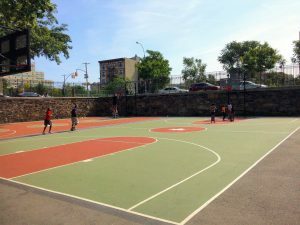 For instance, one community collaborated with its local park and recreation department to identify a location for the Play Streets, which ended up occurring on sections of an underutilized public park, including the parking lot. We are also learning how each community implemented Play Streets, including the partners they are working with and how limited resources are being creatively combined within these organizations. For example, one community partnered with a summer meals program and hosted the Play Streets at a time that overlapped with when children were picked up for their summer meal. The intentional “coupling” of Play Streets with other community or organization events was consistent across the four communities. This approach allowed organizations not only to capitalize on shared resources, but also to reduce the burden and barrier of suburban sprawl faced by rural residents, who often had to travel via car to attend the Play Streets. We look forward to learning more about the impacts of Play Streets on children and families, in addition to important lessons regarding how communities should organize and run them. 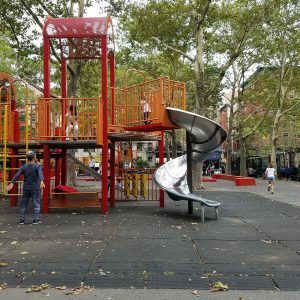 For individuals interested in this method of intervention to promote outdoor play, it is important to know that Play Streets offer an opportunity for safe outdoor play for children, especially in communities that lack safe parks and playgrounds, and/or available and affordable programming opportunities. They are relatively low cost and carry many potential benefits for host organizations, the children who participate and the broader community. Play Streets are a promising intervention strategy that can help communities close gaps in availability of and access to safe places to play and enhance health equity while doing so, especially in areas that have fewer resources and greater challenges to supporting and promoting physical activity and play. The practicality and low costs of Play Streets also provide a “reachable” solution to address challenges around access and availability of safe play spaces that can simultaneously bring communities together in a meaningful manner not only to support their children, but also to improve community connectedness and capacity, potentially increasing social networks within the community and collective efficacy. In many rural areas, public resources are limited, and the idea of advocating for new parks or even renovating parks or other play areas can be daunting and often unrealistic as an immediate or even long-term solution. Working with communities to understand how to advocate for some of these larger environmental changes remains important; however, Play Streets offer a more attainable, immediate and likely sustainable solution, with potential for broader social impacts and reach. Keshia Pollack Porter is a Professor at the Johns Hopkins Bloomberg School of Public Health. M. Renée Umstattd Meyer is an Associate Professor of Public Health at Baylor University. Amanda Walker is a Research Associate for Active Living Research and the Physical Activity Research Center at the University of California San Diego. 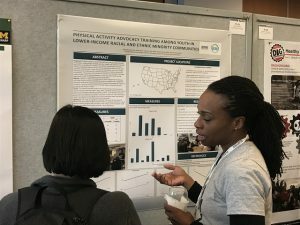 The panoramic views of the Canadian Rockies offered a spectacular backdrop for conversations led by our Georgia Tech research team about the “Physical Activity Advocacy Training Among Youth in Lower-Income Racial and Ethnic Minority Communities” poster presented at the 2018 Active Living Research Conference (ALR) in Banff in February 2018. Our work grows out of the Physical Activity Research Center and its goal to create safe and appropriate physical activity spaces for youth with a focus on low resource, ethnic and racial minority youth. The Youth Engagement and Action for Health (YEAH) curriculum was originally designed by the San Diego County Childhood Obesity Initiative to train youth to assess their neighborhoods and develop advocacy plans to promote health promoting changes. Our team modified the curriculum to focus on physical activity and to study the ways advocacy-training can address disparities in lower-income racial and ethnic minority youth. At the time of the conference, there were six completed clubs, located in suburban Virginia around D.C., Los Angeles, Miami, rural north Georgia, and Charlottesville, VA.
We used pre and post survey questions to understand students’ changing perceptions around leadership, physical activity, and healthy schools/communities. The three largest increases were reported in the number of students who felt they were leaders, those that participated in more than 60 minutes of physical activity in the past 7 days, and those who enjoyed talking in front of groups. For example, 37 percent of students felt they were leaders at the start of the project compared with 62 percent at the end. We also found a 23 percent increase in the number of students that felt they could ask others to help make their school/community healthier. After YEAH site completions, we interviewed adult leaders as well as the decision makers that received presentations from the students. Everyone gave us positive reviews about the project. One leader thought, “It was a great program that gave interactive lessons about themselves (the youth) and their community”. Another appreciated the students taking their research questions to a higher level as well as to watch them grow, especially around communication skills. One leader was surprised by the students’ enthusiasm for the project. Given the recent social movements, especially that led by youth, the youth empowerment aspects of the project were received with great enthusiasm. People wanted to know about student motivations and their level of agency in going through the curriculum and targeting a physical activity challenge to solve. 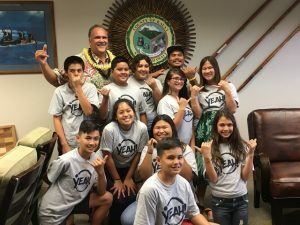 They were also interested in bringing YEAH back to their communities and eagerly anticipated a revised curriculum that incorporated lessons from our study. We now have twenty-six clubs in progress across the U.S. including Miami, Maine, Hawaii, Saipan, and Atlanta. With approximately 300 participants, we will be able to look at our data across ethnicities, ages, geographies, and genders. The YEAH results will be published in academic journals but also converted into resources designed for youth serving organizations to support youth advocacy for physical activity promotion. Long-term, we believe the data gathered around YEAH can help make policy changes. Being at the Mountaintop in Banff allowed us to truly take an extended view of our work and ALR as the “premier venue for policy-relevant research and cross-sector exchange between scientists, practitioners and policy makers on how to create and sustain active living environments” provided a solid foundation and elevated conversations to inspire additional analyses, future research questions and community impact. Play Streets! Have you heard of them? Well, Play Streets are temporary street closures that allow for an area to be used for physical activity with the earliest of these events dating back to the 1920s. With support from the Physical Activity Research Center (PARC), we have been studying how Play Streets are organized and their impacts on kids, families, and communities in rural settings. To get the word out about our work, in February our team gave three presentations at the 2018 Active Living Research Conference in Banff, Canada and in March two presentations at the 2018 American Academy of Health Behavior Annual Scientific Meeting in Portland, Oregon. Our presentations highlighted initial findings from our study. 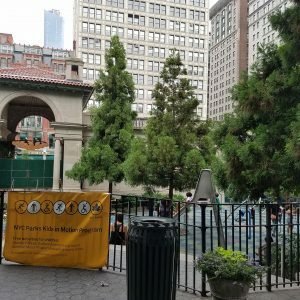 What do we know about Play Streets? Two of our presentations described two systematic reviews of the existing literature regarding Play Streets and their impacts on play for children, physical activity levels, and communities. We examined 13 peer review articles (from 180 abstracts reviewed in the academic literature) that met inclusion criteria for the review. Six of these studies were from the U.S. and 10 out of the 13 studies did not measure physical activity outcomes. We also reviewed the non-academic literature on Play Streets. The 36 documents that we reviewed (out of 247 documents) were from the U.S., U.K., Canada, Australia, and Chile. Nearly all (34 out of the 36 documents) did not measure physical activity outcomes. While most of the documents that we reviewed did not measure physical activity, Play Streets were described as safe places for children to play because of reduced traffic and increased supervision. Games, activities, and equipment were provided for children at Play Streets, most commonly including cycling, dancing, and walking. Some residents complained about traffic detours and noise from Play Streets events. Some organizations hope that Play Streets can decrease crime and violence among adolescents. What do we know about Play Streets in rural communities? Our other presentations examined how Play Streets impact the physical activity of youth in rural communities. We were excited for these preliminary findings because they are from the first ever investigation of Play Streets in rural communities. In our study, four different rural communities received mini-grants to each host 4 Play Streets during the summer of 2017. We used a popular and valid tool for observing physical activity called SOPARC (System for Observing Play and Recreation in Communities). SOPARC has mainly been used to observe physical activity in permanent spaces such as parks, and we adapted it to temporary spaces, which are the essence of Play Streets. Most notable about the use of SOPARC for Play Streets was that during the course of a Play Street, spaces had the potential to appear and/or disappear depending on how children were using the different areas! 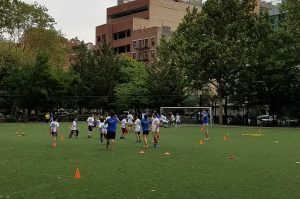 We are still analyzing these data, but what we have seen so far, is that across the 350+ children who wore pedometers at the Play Streets, another way to measure physical activity, many of them were active at the Play Street. Based on existing literature, Play Streets seem to have positive impacts on children’s opportunities for general play and their physical activity levels, as well as on community safety and relations. Our data also suggest that Play Streets are a good way to get kids active in rural communities. We look forward to learning more about the impacts of Play Streets on children and families, in addition to important lessons regarding how communities should organize and run them. 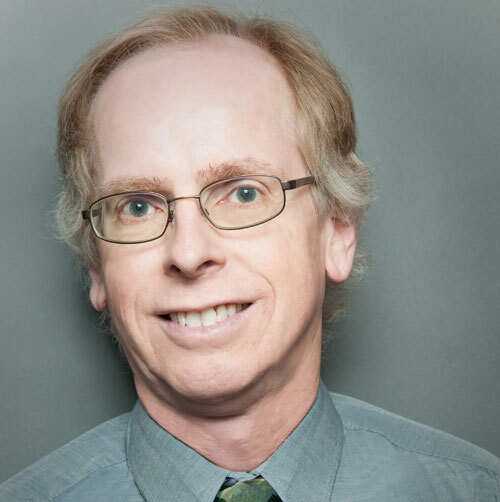 Congrats to PARC’s co-Director Jim Sallis on his recent award! Dr. Sallis is co-PI on our UC San Diego project examining summertime physical activity patterns in diverse, lower-income adolescent populations. The below press release is reprinted from the CDC Foundation website. James F. Sallis, PhD, a distinguished professor emeritus of family medicine and public health at the University of California San Diego and professorial fellow at Australian Catholic University in Melbourne, today was presented the 2018 Elizabeth Fries Health Education Award. This year’s award was presented to Sallis at the 69th Annual Meeting of the Society for Public Health Education (SOPHE). The CDC Foundation with the James F. and Sarah T. Fries Foundation honored Sallis for building an interdisciplinary field of active living research, identifying solutions to the global problem of physical inactivity and translating research findings from the built environment into action. The Elizabeth Fries Health Education Award, first presented in 1992, recognizes a health educator who has made a substantial contribution to advancing the field of health education or health promotion through research, program development or program delivery. For 15 years Sallis directed the Active Living Research program for the Robert Wood Johnson Foundation, which support research and promotes activity-friendly communities. His primary research interests are promoting physical activity and providing evidence to guide policy and environmental strategies to improve physical activity, sedentary behavior, nutrition, and obesity, with an emphasis on youth. His health improvement programs have been studied and used in health care settings, schools, universities and companies. In the United States, the vast majority of adults do not meet the physical activity guidelines of 150 minutes per week. Inactive lifestyles put most adults at risk of cardiovascular diseases, diabetes, obesity, numerous cancers, osteoporosis and psychological disorders. Physical activity can be effective in managing all phases of chronic disease. Research suggests that sprawling cities, often obligating residents to drive frequently, offer fewer opportunities than compact urban areas for walking or biking. As a pioneer in the active living research field, Sallis has developed critical evidence about the role of built and social environments in shaping physical activity patterns. His work has contributed to movements such as Complete Street Policies, which encourage a safe, comfortable, integrated transportation network for all users, the Urban Land Institute’s Building Healthy Places Initiative, the National Association of City Transportation Officials’ standards for pedestrian and bicycle-oriented streets, and the American Institute of Architects’ Design and Health Initiative. These initiatives have influenced city planning and transportation policies and decision making that have led to improvements in health and more accessible, safer physical activity options. Sallis developed intervention programs in school and community settings, including the award-winning SPARK (Sports Play and Active Recreation for Kids) physical activity program that has led to increased activity among more than 1.5 million kids at school. SPARK creates, implements and evaluates programs to improve health and lifelong wellness. He launched the International Physical Activity and Environment Network (IPEN) with the goal to stimulate collaborative research in physical activity and the environment, develop common methods and measures, mentor researchers, and bring together data from multiple countries for joint analyses. Approximately 20 countries from all continents are currently engaged in collaborative studies. The Elizabeth Fries Health Education Award was named in memory of Elizabeth Fries, who was a professor of psychology at Virginia Commonwealth University and co-director of the Massey Cancer Center Outreach Program. She made many important contributions to program development, implementation and evaluation. The Elizabeth Fries Health Education Award recipients receive a $25,000 prize. The award and lecture have been presented annually at the SOPHE conference, which draws approximately 900 health education researchers, faculty, practitioners and students for the latest research and practice in health education. Founded in 1950, SOPHE’s mission is to provide global leadership in health promotion and to promote the health of society. The James F. and Sarah T. Fries Foundation is a nonprofit corporation incorporated in 1991. The mission of the Foundation is to identify and honor individuals, organizations or institutions that have made great contributions to the health of the public. The Foundation seeks to reward accomplishment rather than promise, practicality rather than theory. Congrats to PARC’s Anna Kim on her recent award! 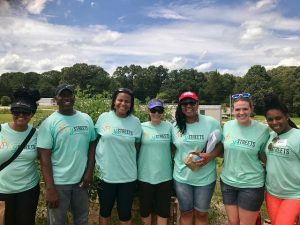 Dr. Kim is co-PI on our Georgia Tech project which assesses how training youth to be advocates for changes in the built environment can foster health and produce positive policy and environmental change. The below announcement is reprinted from the Georgia Tech School of City and Regional Planning website. 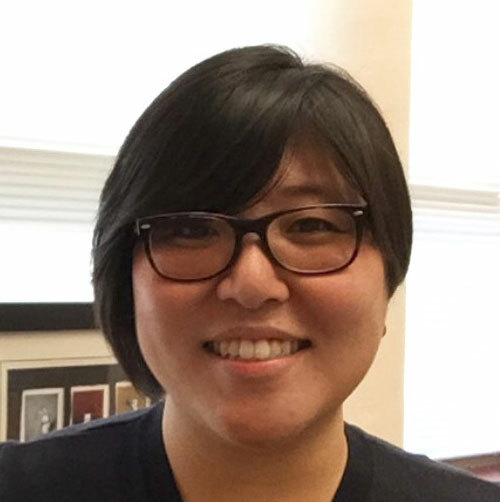 Georgia Tech School of City and Regional Planning Assistant Professor Anna Kim was announced the Scholar Prize winner for the 2018 William R. and June Dale Prize for Excellence in Urban and Regional Planning. This year’s award theme was on planning with immigrants in communities and regions. Kim’s research examines the blurred boundaries between informal and formal jobs for low wage immigrant workers, and how these semi-formal employment arrangements translate into strategies for local economic growth in ethnic neighborhoods. Her studio course projects include work in the greater Atlanta area and supports efforts to understand immigrant communities. “I am honored to receive the Dale Prize in Planning Excellence. To have received the prize in recognition of my research and on-the-ground practice of ’planning with immigrant communities and regions’ is wonderful, and it’s exciting to see broader recognition of this in our field. Recently, my studio graduate students were also awarded by the Georgia Planning Association for our work with refugees in Clarkston, and I’m proud to see how passionate planners are about planning with and for diverse communities and making sure that all voices are heard,” said Kim. The Dale Prize is awarded by California State Polytechnic University, Pomona’s Department of Urban and Regional Planning and invites recipients to meet with students and to speak at a two-day colloquium held on campus. The National Collaborative on Childhood Obesity Research (NCCOR) has been a leading force in the field since 2009. A successful example of public-private partnership among the main federal and foundation funders of health research, NCCOR has coordinated funding of studies, development of resources, capacity building, and dissemination of results. As presented in new papers in American Journal of Preventive Medicine, NCCOR has many accomplishments that have advanced research and provided assistance to practitioners. I have had the pleasure of serving on the National Expert Scientific Panel since the beginning of NCCOR, so I am not a disinterested observer. However, I have been impressed by the level of collaboration among the funders, their openness to input, and the creativity of their projects. I was pleased to provide a commentary on the impact of NCCOR over the first eight years. It is likely that many people actively involved in childhood obesity work are not aware of the full range of NCCOR’s projects and resources. I commend this special section to everyone looking for solutions to the childhood obesity epidemic. Many of the resources will also be relevant to anyone working on physical activity and healthy eating in any population.